As a youngster growing up, Tony Brown was a Leeds United supporter who cheered on Don Revie’s all conquering team from the terraces of Elland Road. Little did he know that one day he would line up in the white shirt alongside Peter Lorimer, David Harvey and the Gray brothers, Eddie and Frankie. “I had been playing well in the Central League and Eddie gave me the nod to step in and make my debut at the start of May against Leicester City at Elland Road due to the fact that Paul Hart was out injured. The two games Tony played in were a 2-1 home win over Portsmouth at the end of October and a 1-0 defeat at Carlisle United in December. His next appearance came on the 4th of February, ironically against Shrewsbury Town, and this time it would be a much sweeter afternoon for all concerned. “We had been working on set pieces leading up to the game and we got an opportunity to put a routine into practice. A free kick came over and I managed to head the ball home at the South Stand end. In total Tony made 22 appearances in his first full season, which was a fantastic achievement but unfortunately he never got the chance to build on that. “I enjoyed it at Belle Vue but returned to Elland Road and played in an away game at Portsmouth which was the only time I featured for Leeds that season. Doncaster were keen to have me back, Eddie was keen to sign Ian Snodin and I was included as part of the deal which eventually went through in the summer. “My time at Leeds was fantastic. We had a decent mix of youth and experience and there were some great lads at the club, some real characters and I got on particularly well with Martin Dickinson, Neil Aspin and Kevin Hird. “Not long after I had left Eddie got the sack, which was a real shame. He didn’t get the time or money he needed despite moulding a promising young squad. Tommy Wright, Denis Irwin, Scott Sellars, Terry Phelan amongst others moved on after Eddie left and they proved how good they were. 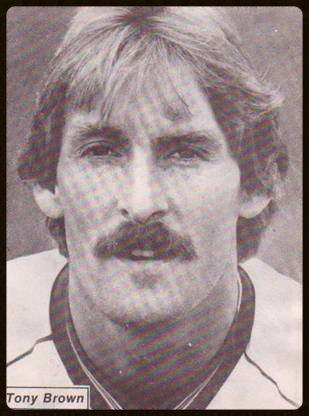 Tony went on to captain Doncaster before moving on to Scunthorpe United and Rochdale. After retiring as a player he had a spell managing non-league Eccleshill but these days his involvement with football is purely as a spectator and he often gets to watch the current Leeds side. Thank you to Tony Brown for giving me his time and the opportunity to write this article.